Hunter Lachance of Kennebunk, Maine, speaks while appearing before the Senate Judiciary Committee during the final stage of the confirmation hearing for President Donald Trump's Supreme Court nominee, Brett Kavanaugh, on Capitol Hill in Washington, Friday, Sept. 7, 2018. 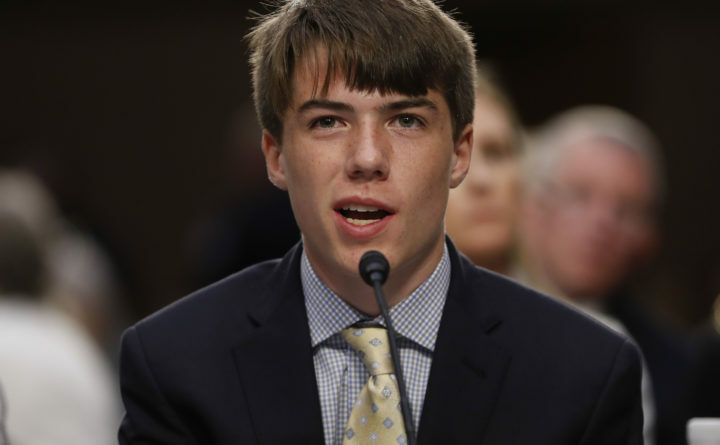 WASHINGTON — A teenager with asthma from Kennebunkport, Maine, is asking senators to reject Supreme Court nominee Brett Kavanaugh, citing some past rulings that he says have harmed the environment. Lachance, a sophomore at Kennebunk High School, cited a 2012 ruling that rejected an Environmental Protection Agency rule aimed at regulating air pollution that crosses state lines. He said he was diagnosed with asthma at age 10, and noted that breathing during an asthma attack is like trying to breathe through a coffee stirrer.